It’s not perhaps a beer for breakfast, but it is a breakfast beer. John Wright puts surplus cereal to good use in a light but full-flavoured bitter. “I hate waste, and spend a lot of time devising interesting ways of using kitchen scraps. No chicken carcass or leek top escapes my kitchen without being used in a stock, and all pastry off-cuts are turned into (largely inedible) jam tarts rather than being consigned directly to the bin. A neglected box of Sugar Puffs whose contents have set into a solid, intractable lump is a fairly regular sight in our kitchen and it is only recently that I hit upon the (though I say so myself) rather brilliant idea of turning them into beer. Provided they have not gone completely stale, using Sugar Puffs to make beer is not as mad as it sounds. 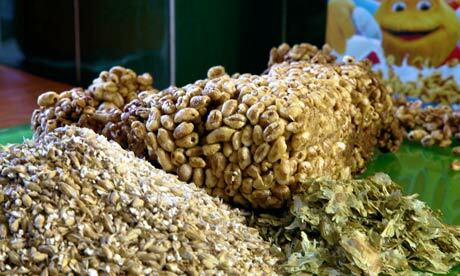 Although barley is by far the most important cereal for beer-making other cereals are used too. Well-stocked bars will often have a few bottles of wheat beer sitting on their shelves and they are well worth trying.